What better way to kick off gamescom in Cologne, Germany than to use the enticing 2014 Mercedes SLS Black Series as a taxi? At gamescom in Cologne, Germany Sony Computer Entertainment Europe is introducing the new DRIVECLUB racing game to the European public for the first time. This is a brilliant way for Mercedes to introduce a new generation of cars to a new generation of car buyers. Mercedes-Benz has appealed to the high-end luxury buyer, but things are changing at Daimler AG in Stuttgart, Germany. They are introducing the all-new 2014 A 45 AMG and CLA 45 AMG to a younger generation who have never purchased a Mercedes-Benz car before. In a smart marketing move, they are partnering with Sony Computer Entertainment Europe and introducing five high-performance AMG cars to a new generation of buyers through the new racing game on PlayStation 4. Young Millennial European gamers will have the opportunity during gamescom to experience the new racing game on PlayStation 4 and test the “breathtakingly realistic driving performance" of the Mercedes performance and super sports cars. The 2014 A 45 AMG and CLA 45 AMG will especially appeal to the Millennials who they are targeting through gaming. 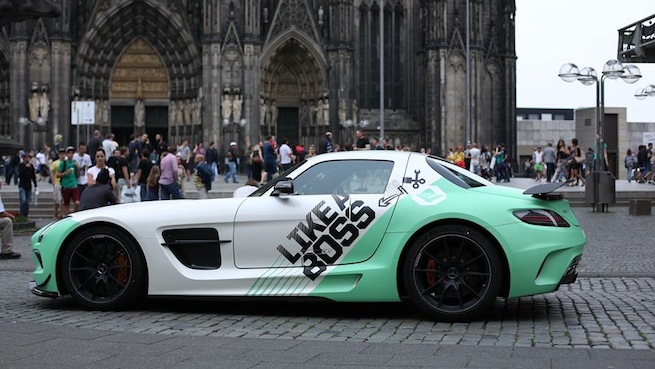 But Mercedes is also introducing the ultra-performance 2014 SLS Black Series Coupe to the gamers by using it in Cologne as a key promotional vehicle. In a PlayStation "tweet-to-ride" competition, twitter users can win a ride in the super sports car. This is a great marketing move by Mercedes as the new supercar is one of the most sought-after high-performance cars on the planet. In the video below, Mercedes transformed the gull-wing sports car with exterior graphics into a taxi. Gamers who win the PlayStation "tweet-to-ride" competition get a chance to be picked up at home and given a ride to Cologne where gamescom is being held. The winners were impressed to say the least with the new supercar when they get out of the 622 horsepower AMG SLS after the ride. The 2014 Mercedes-Benz SLS AMG Black Series accelerates from 0-60 mph in just 3.5 seconds with a top speed of 196 mph. That would make this car the fastest taxi in the world. The supercar is definitely intoxicating for anyone lucky enough to win a ride in the fastest SLS of all time. Watch The Ultimate #DRIVECLUB Taxi video.